The world is going to end… in a few billion years. In the meantime, don’t worry about it. There is plenty to focus on right now. Because for as long as anybody reading this story will live (I am willing to fade efforts to live forever), the Earth will continue spinning on its axis, the sun will rise in the east, and the global economy will continue to exist. As you’d expect, in the wake of the financial crisis there was a notable spike in this index and, in the eight years since, the EPU index has remained elevated. There’s a correlation between this and actual economic growth: A 90-point rise in the EPU index is associated with a 1.2% drop in US GDP over a the course of a year, a vivid example of George Soros’ reflexivity principle wherein market prices create the fundamentals those market prices aim to reflect. 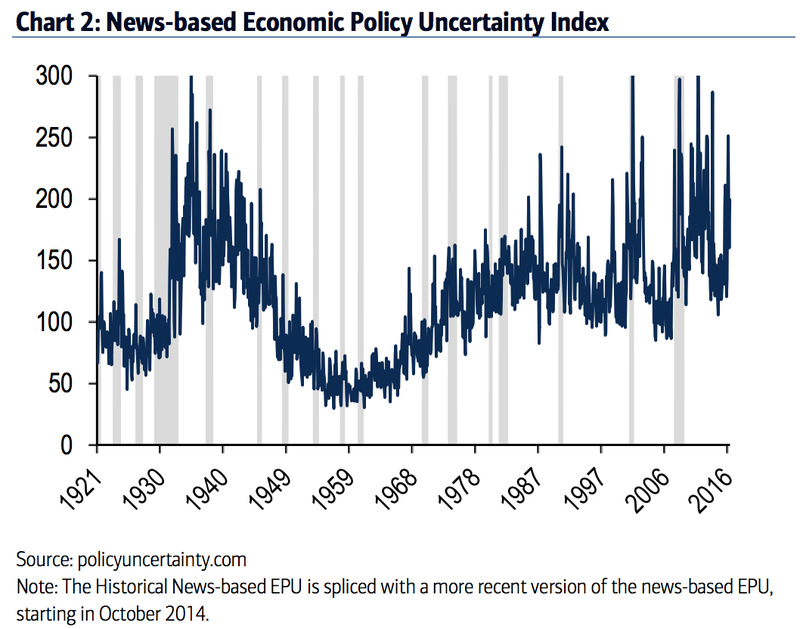 And while this index is a serious attempt at quantifying the impact uncertainty about the future can have on current economic activity, I think this chart is just as much a reflection of anxiety about something more daunting: people are legitimately worried about the end of the world. In a recent investment outlook, Janus Capital’s Bill Gross wrote that capitalism, the global elite’s preferred economic model, risks burning itself out just as we know the Sun will one day. For many, the depths of the financial crisis very much did seem like the end of the world, like an event that would precipitate a complete collapse in everything we’d come to believe in. It is not, then, a total surprise to see an increase in uncertainty in the years that followed. My colleague Andy Kiersz wrote this weekend that the Brexit vote for the UK to leave the EU ushers in the end of Europe as we know it. I think this is irrefutably true. Europe was one way on June 22 — damaged, but still broadly moving towards an ever-closer union — and by June 24 was moving another direction. And because we’ve seen 25 years of relatively placid geopolitical conditions in a post-Cold War world, this decision from the UK seems jarring. But now it is time for us to realise that history did not end in 1992. If the events of September 11, the financial crisis, and now the Brexit vote (among dozens of other globally chaotic events) haven’t made us realise that trauma is forever and always core to the human experience, then of course nothing will. Some of us will always pine for the days of yore, a simple manifestation of the desire to do the one thing we know we can’t: turn back time. Uncertainty, however, so often becomes a convenient way to couch deeper fears about the collapse of society, the true End Times, the Book of Revelation made real and vivid in the modern world. this is in the Bible — is a time-honored human practice, I think that as much as our fixation on uncertainty reflects any new questions about the future, our increased use of the word has become a crutch. It has in fact become a way to posit faux humility about one’s ability to know the future while ignoring what is actually happening right in front of them. The results of the Brexit referendum stunned global markets and many in the UK, but as Mike Carter wrote in The Guardian, after walking from Liverpool to London, Brexit came as no surprise. Donald Trump is just one step away from the White House. Unlike the UK’s referendum, a simple majority of the vote will not deliver to Trump the presidency, but his ascent from reality-TV personality to Republican nominee for president has taken most of the establishment by surprise. Though I’d posit that, if perhaps we weren’t so certain about our uncertainty, this ascent wouldn’t have been so shocking, and we wouldn’t be so surprised that someone spewing half-truths to an overlooked and underserved voting bloc was able to garner so much support. Trump, like Brexit, doesn’t exist in an uncertain future. It’s here. Right now.